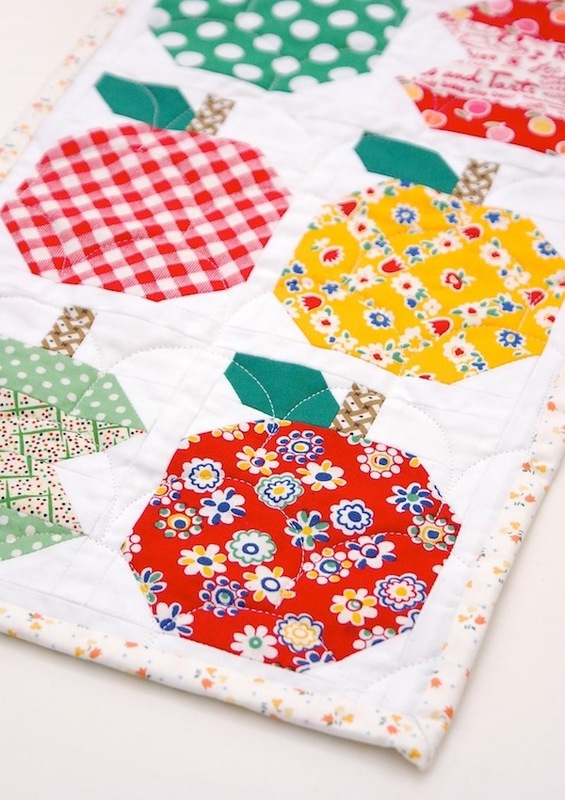 Next up on the mini quilt train is this super cute apple design by Lori Holt. I fell in love with the apple's from the Quilty Fun book the moment I saw it and immediately put it on my 'sewing to do list'. The pattern originates from a full size quilt, but I knew exactly what I had in mind for these delicious apples ;) I also already had the fabrics chosen in my head (this usually happens when I plan my quilt projects). I'm so happy with how it looks in my kitchen on my vintage yellow cabinet. You can see it from the living room, so it's nice to have a touch of Lori's fun and happy personality in my home now. One of the reasons I love making mini's at the moment is being able to try out new quilting designs without committing to a huge piece. For this one I tried a scallop design - I adore anything scallop! I used an acrylic circle template to draw half circles with a water erasable pen and followed the lines with my walking foot. Ok, so to those who think I'm completely addicted you're right. I am, but to my defence this one was made before Christmas, I just haven't got round to sharing it! Again, from the Quilty Fun book, this one was a gift to my nana, who uses it as a table centre in her kitchen - she has a blue theme going on in there so I thought I'd stick to the colour theme. We all like a bit of matchy, matchy in our family. 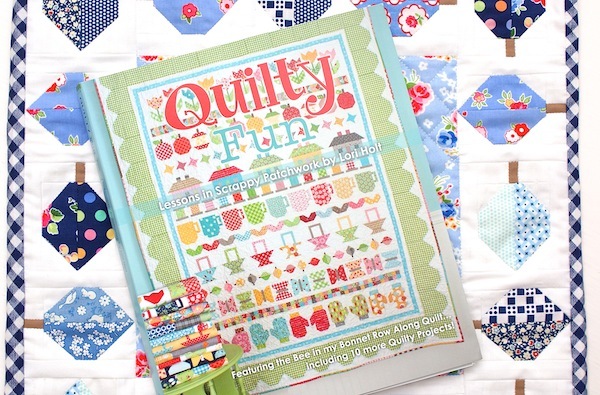 I did the quilt along on Lories site last year...and then bought the book when it came out. The apples where one of my favorite blocks. I had fun picking the fabric for them including a plaid fabric for the Macintosh apple! We have that cabinet - it's in the garage at the moment, but I have plans to use it for fabric! I love both of your minis! I got lori's book for Christmas and can't wait to make something out of it. I already have the fabrics picked out to make a mini from the cup block! 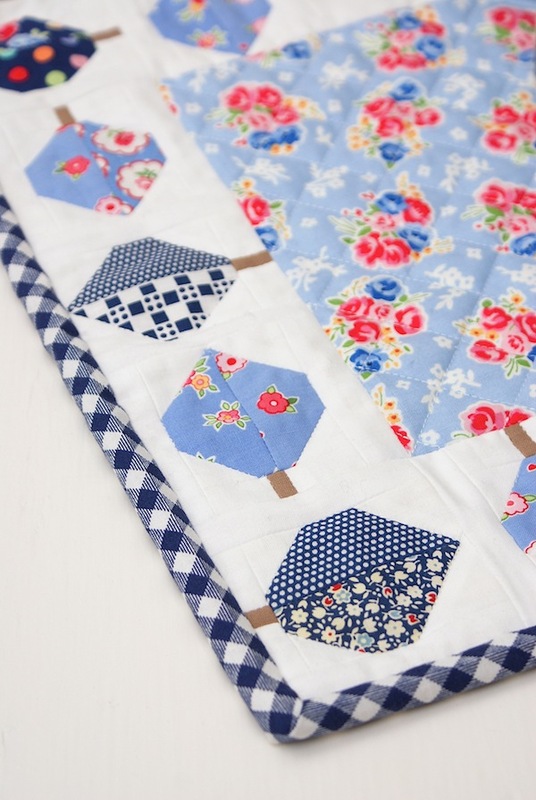 love the mini apple quilt....I much prefer smaller projects as well! Absolutely beautiful work. The colours are so clean and fresh. Wow, so much lovely going on here! 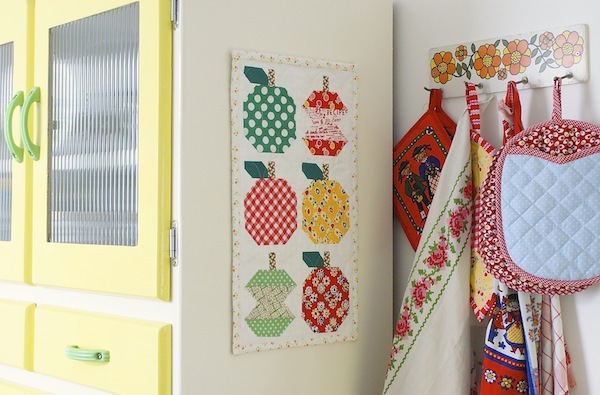 Love both the quilts and the apples are perfect for your kitchen too. I'm also very impressed by the scallop quilting and for some reason I'd never thought of using a water soluble pen - what a great idea - I want to give that a go! This is totally adorable, and it looks just so doggone cute in your kitchen! Do you actually sell this book in your Shop?